Situated within walking distance of Brixington amenities including the School, 57 bus stops and Park is this extended 3 bedroom and 2 reception room semi detached house, on a good sized plot and gaining Exe Estuary and Haldon Hill views from the rear. This gas centrally heated and double glazed property comprises, on the ground floor, of cloakroom, living room, dining room, kitchen and utility. On the first floor are the 3 bedrooms and bathroom. 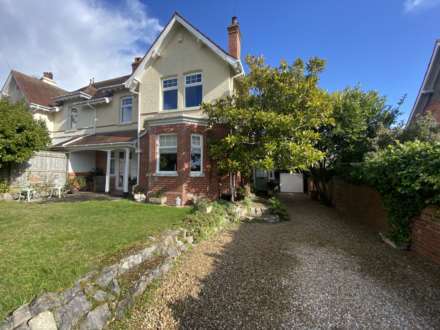 There is ample off road parking, an attached garage and a good sized, Westerly facing Rear Garden. An appointment to view is strongly advised. Window to front. Obscure uPVC double glazed external door to side. Range of cupboard and drawer storage units with roll edged work surfaces and tiled splash backs. Stainless steel single sink and drainer unit. Gas cooker point. Space and plumbing for dishwasher. Further space for freestanding fridge / freezer etc. Useful larder storage cupboard with electric meter and fuse box. Wall mounted, gas fired, combi boiler supplying the central heating and domestic hot water. Obscure glazed window to front. White suite of low level WC. Inset ceiling light. Laminate flooring. Window to rear gaining far reaching Exe Estuary and Haldon Hill views. Storage recess. Radiator. Exposed floorboards. Window to rear gaining those far reaching Exe Estuary and Haldon Hill views. Radiator. Exposed floorboards. Obscure glazed window to front. White suite comprising panelled bath with mixer tap and shower attachment, low level WC and pedestal wash hand basin. Tiled splash backs. Radiator. Wooden flooring. The Westerly facing and good sized Rear Garden has a patio area immediately adjacent to the property, being ideal for outdoor dining and sitting during the fine weather. The remainder is then laid to lawn with a membrane covered area to the rear. Willow Tree. Timber fenced boundaries. Outside water tap. Front pedestrian access to side of property via timber garden gate. From our prominent Town Centre office, proceed down Rolle Street turning left at the first roundabout and right at the second, past the Train Station, into Marine Way. Continue through 2 sets of traffice lights and take a right hand turning into Hulham Road signposted Honiton and Ottery St Mary. Continue up Hulham Road until you reach a mini roundabout and turn right into Pound Lane. Take the second left into The Marles and left again into Brixington Lane where the property can be found on the left hand side, clearly identified by our For Sale sign.